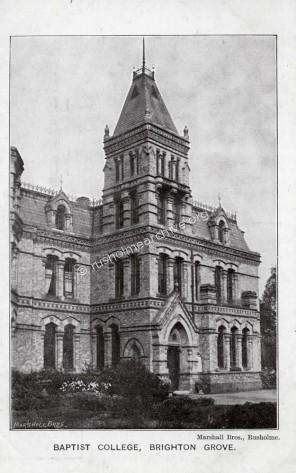 In the photograph above, the fine gated entrance with the small classical lodge was probably the work of Manchester architects Atkinson and Clayton. 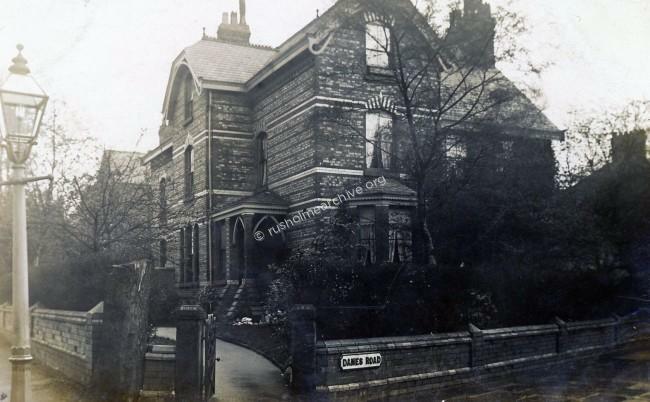 In the photograph below probably taken in the 1920's the Lodge can be seen from Wilmslow road looking in a southerly direction. The Brighton Grove Villas prospectus was published in July 1836. The prospectus drew attention to the wealthy inhabitants of Manchester amongst whom it said 'there was a great want of respectable residences that should be situated so as to possess the advantages that the country affords but not too far from the town'. The prospectus also referred to the new Victoria Park estate as only being able to satisfy some of that need. Perhaps the most apposite sentence in the prospectus posed the question, 'Who would have expected a few years ago that every respectable inhabitant in Mosely Street would have been compelled to quit their dwellings, and that these houses should be so quickly converted into marts, (markets) for trade?' This reference is to the large and fashionable residential area around St Johns Street that was built in Manchester in the 18th century. 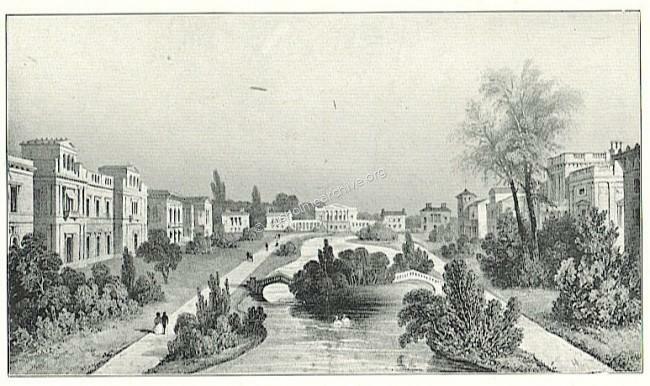 The prospectus referred to the optimistic drawing above as the 'published view' and the lake was to be presumably created by damming Gore brook(?). It seems unlikely that £40,000 was raised, as much of the space in this view is taken up by the Brighton Grove Allotments! 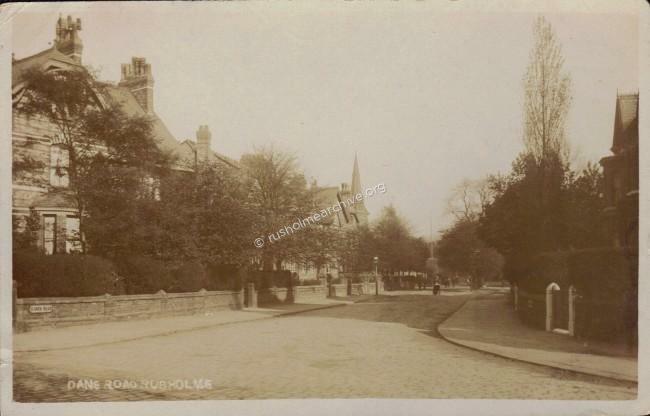 Other than the lodge and gates there were just two buildings completed, one to the left of this view on Wilmslow Road, ( and still standing), whilst another was the first building on the left as you entered the Grove, (demolished in the 1970s). 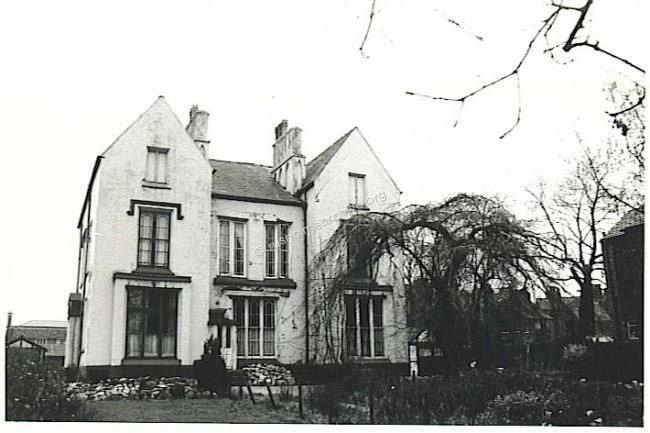 To the right an early Victorian mansion was eventually built called Appleby Lodge that ultimately became a Hotel. 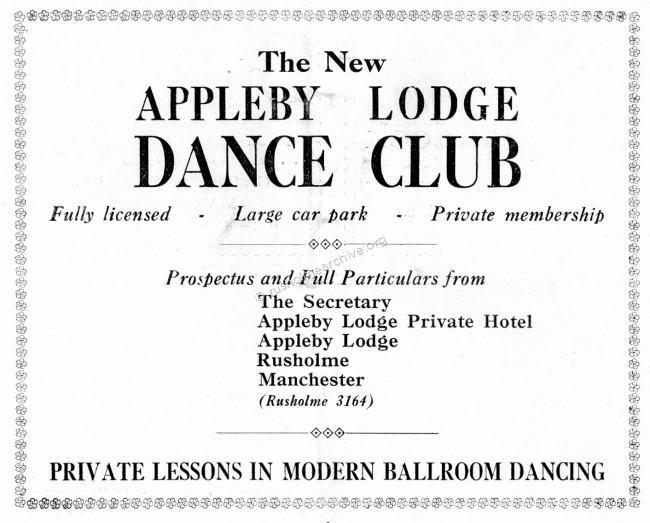 This was demolished in about 1935 and replaced with the present block of flats, (also called Appleby Lodge), circa 1936-39. The advertisement below is taken from a Rusholme Repertory Theatre programme, (price twopence!) dated Jan 9th 1933. 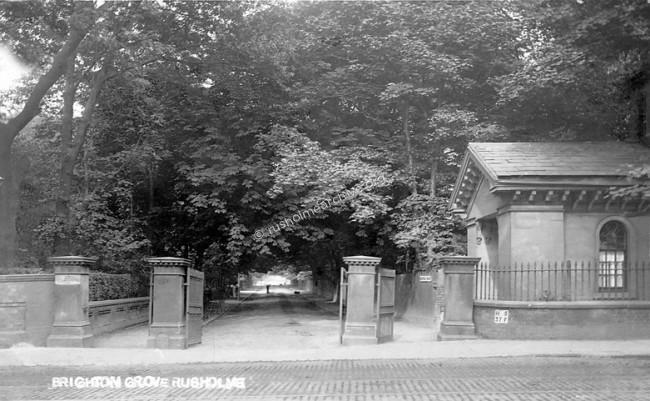 In the photograph above of the entrance to Brighton Grove all that remains now is the gatepost on the left. Although the very grand scheme of the Brighton Grove Estate was never achieved, the Grove certainly had some fine villas built in the area later in the mid-Victorian era. 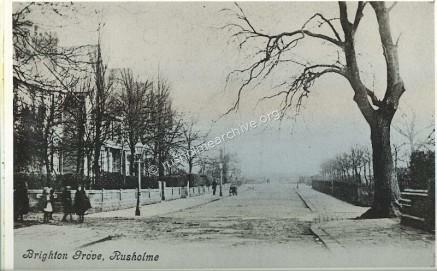 It certainly would seem that the Grove was a comparatively peaceful haven and a desirable address. In the postcard view above the dance club notice there is quite a rural feel to the Grove. William Royle said in his History of Rusholme that in July 1913 King George V and Queen Mary paid a state visit to Manchester. They listened to 25,000 children singing the National Anthem in Birch Park and then departed to Platt Fields. 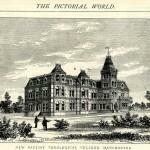 In October 1872 the foundation stone was laid for a new Baptist training college, the previous college having been at Bury. 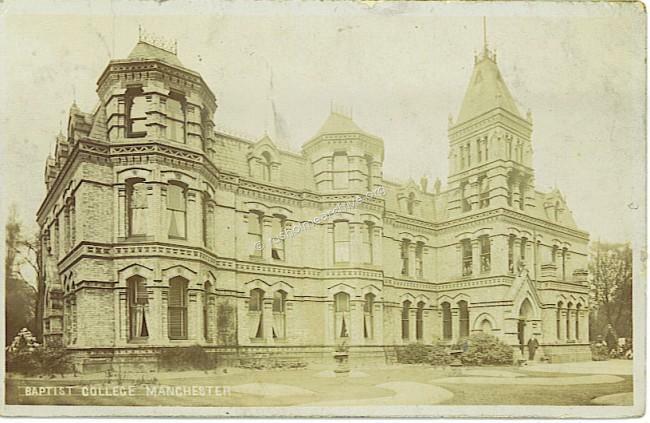 A particularly grand Gothic building, very much in the fashionable 'Waterhouse' style it was situated just a little along Brighton Grove on the left-hand side. The architect was a Mr Henry Pinchbeck of Manchester. 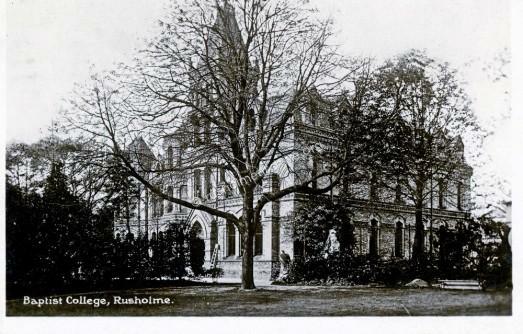 The college was eventually opened for 25 students in September 1874, the cost of the land and building being just under£10,000. The following item with the illustration to the right appeared in the The Pictorial World on September 12th 1874. "WE give a view of the new Baptist Theological Institution, which has been erected in Brighton Grove, Rusholme, Manchester, and which was formally opened last week. It is a very handsome structure. After the opening ceremony a luncheon was served in one of the class-rooms of the building, when the principal, the Rev. H. E. Dowson, presided. In the course of the speech which he made on the occasion he showed with some eloquence the necessity for such an institution. It had been felt, said he, that the operations of the Baptist Evangelical Society, whose object was to educate young men for the Christian ministry, should be more extensive and demonstrative, as the churches required pastors of their own faith and order. 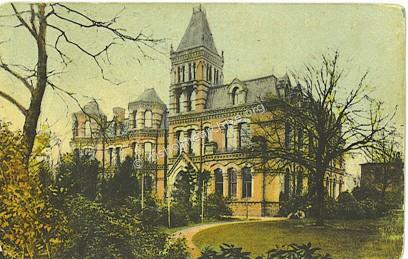 The college was first established at Chester, but was removed to Chamber Hall, Bury, in 1868. When the latter place fell into decay, the idea arose of erecting a building which would be on a more extended scale. The site which had been chosen had the advantage of being near one of the most important cities in England, and at a convenient distance from Owens College. Of the 39 students who had been received at the college up to the present time, two had died, 25 were in the ministry, and ten remained at their studies. All who had gone out had remained firm to the doctrines which the body held, nor had any dishonoured Christ by any act of immorality. The necessity for such an institution as theirs became every day more apparent. Loose doctrine, necessarily connected with laxity in Church government and polity, was spreading on every hand, and young ministers must therefore go forth with the settled principles and unmistakable sounds of Divine truth, based upon the Bible. There must be no double-mindedness or pandering to worldly tastes and human inventions, and no craving after popularity. The truth of God was worth defending, though it should be in the midst of opposition and contempt. Subsequently it was shown that the cost of the building and incidental expenses in all, £9,695 — had been nearly raised. The Rev. Dr. R. A. Fyfe, principal of the Baptist Institute, Woodstock, Canada, and other gentlemen also gave addresses, one and all dwelling on the good the Baptist body have done". 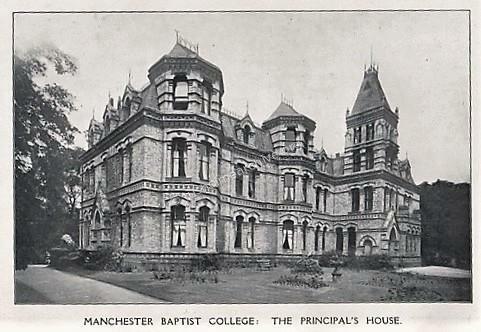 The Baptist College in Brighton grove is a new building, the institution has been recently removed from Bury. The Board of Health hold monthly meetings in their room within the building; vestry meetings are also held here. There is a large room on the first floor, which is let for various entertainments and lectures. In connection with that building is a commercial school for boys. The offices of the surveyor and collector to the Board of Health, and Government tax collector, are also here. In the mid 1960s the building was demolished and replaced with the present buildings of the Luther King House Educational Trust. The photograph below was taken in 1970 of a pair of villas in Brighton Grove that possibly were designed by the architect Richard Lane. They still survive but the property on the right has since been extended and somewhat altered. The properties lie to the east and adjoin the Luther King House site and obviously pre-date the Baptist College in the photograph above. Looking eastwards towards Birch Park the first postcard view below has been taken from the footpath outside of the villa above. The entrance gates can be seen on the left of the frame.The first and third postcards are dated 1912 - the second photograph is undated and the view point is further east than the first card. 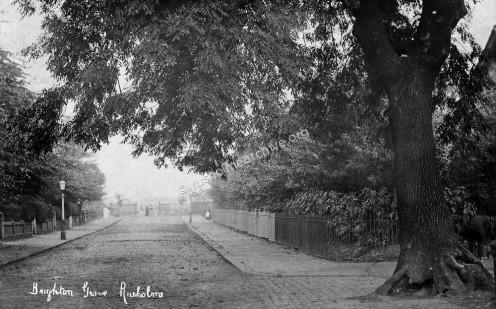 In the photographs, (both undated) above & below the large fine villas that lie between Dane Road and the Birch Grove junction are still standing. To the right of the photograph above are the Parish rooms of St James Church. 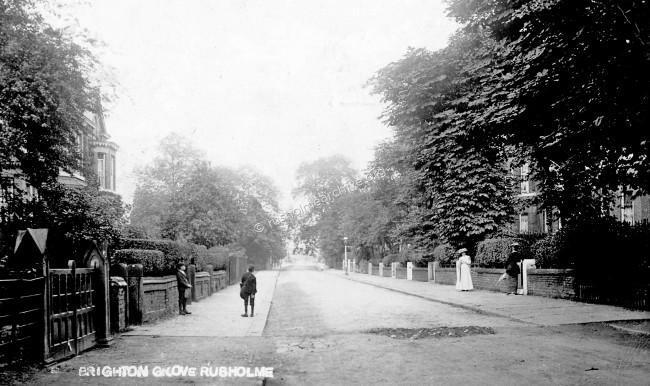 In the photograph below taken from the junction of Birch Grove and looking west down Brighton Grove the trees and hedges in front of the villas are all in full leaf. Noted residents in Dane Road. My colleague Harry Spooner who is forever searching the Rusholme Census returns found the following entry in the 1911 Census. 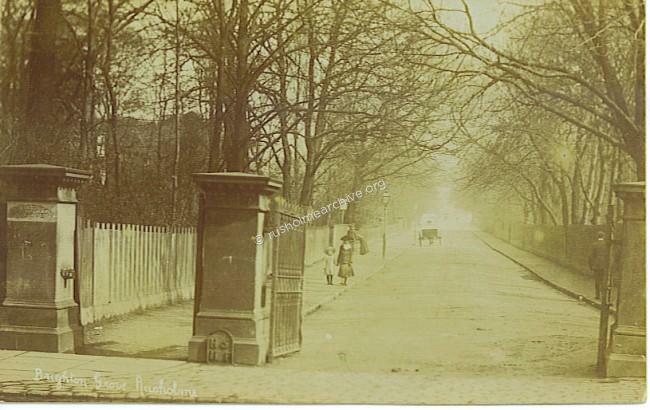 We are unsure at the moment where the 'maisonette' was in Dane Road, perhaps we will find it in due course. Israel Moses Sieff, Baron Sieff (4 May 1889 – 14 February 1972) was a British businessman. He was educated at Manchester Grammar School and Manchester University. 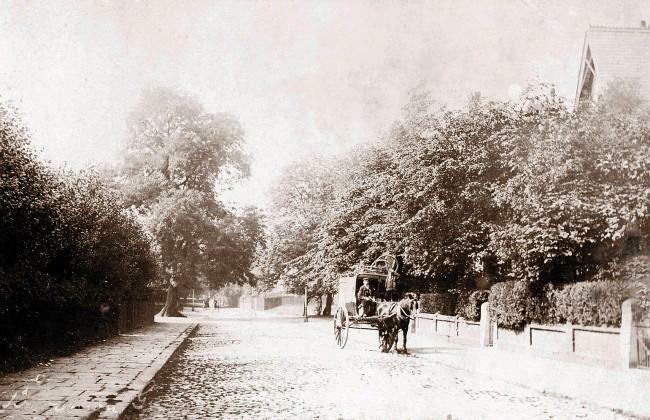 Birch Lea, below, corner of Danes Rd & Norman Rd. 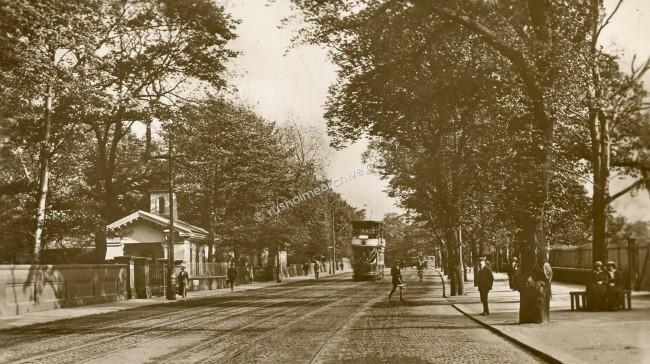 Birch Park entrance, Brighton Grove & Birch Grove corner. 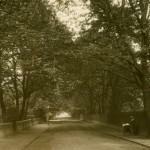 This photograph above must have been taken perhaps 1900-10, the absence of any mature trees or shrubs is very evident!